Why Choose Our Hand and Wrist Experts? At The Orthopedic Clinic, we give our patients the ability to live their very best life in full motion. We approach hand and wrist care with this mindset, customizing our treatment plan to you. Why? Because we believe this is how to provide the best care possible. That’s what you deserve. What Do the Hand and Wrist Do? The hand has a complex structure that allows for a wide range of motion. Its functions include grasp and pinch. The wrist helps us flex and extend the hand and rotate the forearm. An injury to either your hand or wrist can greatly impact your quality of life. Given that the hand alone consists of 27 bones in addition to muscles, tendons, and nerves, hand injuries are common. We offer comprehensive trauma care of the upper extremity, including treatment for distal radius and scaphoid fractures and finger fractures and dislocations. Conservative and surgical approaches are utilized, depending on the injury. Our goal is to restore the bony anatomy in order to regain function of the hand and wrist. Management of Dupuytren contracture is aimed at regaining hand function rather than curing the disease. Non-surgical options include Xiaflex injections, performed in the clinic. We also perform subtotal palmar fasciectomy. This is the surgical removal of the palmar fascia, which causes the contracture. We tailor our treatment plan to the patient’s needs. 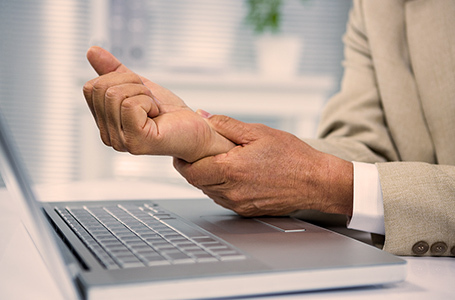 Are You Having Pain in Your Hands or Wrists? You use your hands and wrists every day, all day. If they hurt, it will massively impact your day-to-day life. We can help get you back to normal. Our hand and wrist specialists are only a phone call away.